I am excited to be attending the International Toy Fair in New York for the first time this week. This is a huge event where manufacturers introduce their new products – some won’t be on the market until the Fall and retailers come to preview and place their early orders. My press pass (as a blogger) is giving me access to information that I will be sharing with you in the next few months as I do reviews and sponsor my first giveaways. I was invited to a bunch of special events and attended two of them – Hasbro and Lego. I’ll be writing about each of them in the coming weeks. On Saturday I attended the special event at the Hasbro showroom in NY. I was invited to this event for mommy bloggers by the Litzky Public Relations firm who has added this Grandma blogger to their Mommy blogger list. I took copious notes during the small group tours of the extensive Hasbro line. Don’t think you’ve heard of Hasbro toys? Well you definitely have. I’m willing to make a nickel bet you have a Hasbro product in your closet right now. Do any of these names sound familiar: MONOPOLY, TRANSFORMERS, GI JOE, LITTLEST PET SHOP, MY LITTLE PONY, PLAYSKOOL, MR. POTATO HEAD, TONKA, NERF, BABY ALIVE, EZ BAKE OVEN, PLAY DOH, STRAWBERRY SHORTCAKE, TRIVIAL PURSUIT, CANDY LAND, LIFE and CLUE. Zach, my eight month old grandson, is mesmerized by Sid the Science Kid. Grandparents - This is a popular new show on PBS which preschoolers love. In the Fall Hasbro will be introducing a whole line of Sid the Science Kid toys and they will be on my Christmas shopping list for sure. I want to play with this preschooler science set with my grandson so much. I have all sorts of ideas from using white shirts as lab coats, goggles for lab safety and taking lab notes in a notebook to add to the fun. In case you don’t know my husband and I are engineers and we had a lot of “science play” with our kids. I really liked the whole line of Wheel Pals – small squeezable animals (farm, jungle and Arctic versions) on wheels. These are available in assortment packs or individually. They reminded me that we used small gifts when potty training our kids – they would get to choose a gift from a basket when they remembered to use the toilet – this method really works. If your toddler likes these you can have them earn the whole collection and be toilet trained stress free. These are a nice size for toddlers – not too big and not too small and I see them to have a lot of imaginative play possibilities – a winner. A crowd of mothers aah-ing gathered around a new line of weebles in their original egg shape, wobbly form. 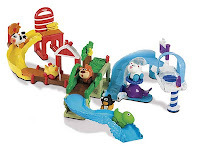 Young children can engage in interactive play with figures and playsets featuring Spider-Man, kids, a musical treehouse and more. This will be another winner. I enjoyed Mr. Potato Head when I was a child and when my kids were children. Now there are many versions of Mr. Potato Head but this one really caught my eye: It is a Plush Toy Story version suitable for a toddler. It is larger than the plastic version but the colors are true to the plastic one and it looks like “the real thing.” My only problem with it is that it is a talking version with batteries. You can always not use batteries and enjoy a quiet Mr. Potato Head – as he was intended to be. There are a bunch of new products for infants in the Gloworld line including this cute rattle that was in our gift pack to bring home. My eight month old grandson got a good grip on this rattle, enjoyed the simple old fashioned rattle sound and bit into the feet and ears. If you remember “Gloworm” you may be attracted to this theme of developmentally oriented infant toys. Hasbro says that the PLAYSKOOL's Explore N Grow line of toys are made for “laughter, learning and lasting value.” Guess what? I think they’re right. I was impressed with many items in this line. The gears are removable and I can picture a toddler having fun figuring this toy out. 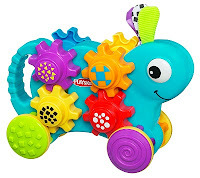 Maybe it’s the engineer in me that was drawn to this toy which screams “How does this work?” This toy will inspire curiosity and exploration – I can picture Zach playing with it as soon as the putting everything in his mouth stage is over. My one big disappointment is the Tonka line. As the grandmother of an 8 month old boy I am looking forward to buying “big trucks” – first in plastic and then in metal. A preschooler does not need a $40 talking truck. Talking dolls – maybe, but this Chuck –the Talking Truck is stupid and overpriced. However, the Toy Fair experts thought it was great and it won a Toy of the Year award. At the toy fair I was looking for a basic good quality yellow plastic dump truck without batteries. I didn't see one until the end of the day and I think the guy at that booth was looking at me like there was something wrong with me that I got all excited about this plain old dump truck. It was after 5 PM and by that time no one was excited about anything anymore I'm sure. I'll write about that in another post. So this is the first of my Toy Fair reports. I think I saw a million toys and I'll be writing about ones I think will be attractive to grandparents. Check back soon, leave your comments and experience with these toys and enjoy playing with your children and grandchildren! And thank you to Hasbro and Litzky Public Relations for providing and informative and enjoyable day with them. Thanks so much for the "Glimpse" of the Toy Fair in NY. I can't wait to read your follow up articles and will stay tuned. Grandma of 2 year old girls. Expecting a grandson in June. Age group for Pre-school? 2 to 5? 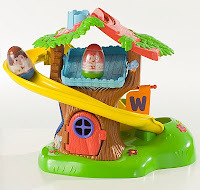 Many great toys I've given usually say, not recommend for children under 3! In your experience, are manufacturers just being safe? Any advice greatly appreciated. I watched this Toy convention event in LA last year. Most of the creators are young individuals.